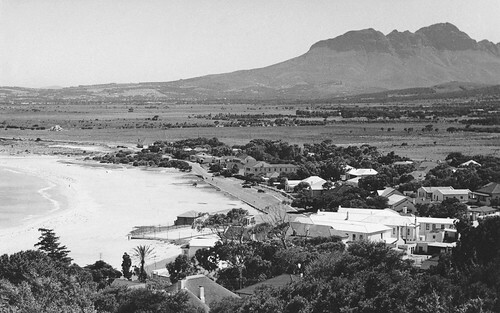 Gordon’s Bay was our family’s beach during the ’50s and ’60s. We spent many playful hours in its warm waters, holidaying at Thelma’s Guesthouse – now long gone – and watching the fishing boats in the old harbour. The black and white photo below shows the bay and town in 1950. Compare the landscape to the unsightly urban sprawl still spreading like a cancer across the Helderberg bowl in the other photos on this page. Above the harbour on the mountainside, an anchor frames the letters “GB”. It is laid out in whitewashed stones on a scree slope. The landmark dates from 1949 when cadets at the “General Botha”, the South African Nautical College of the merchant navy, laid it out to identify the location of the General Botha in the old harbour. In my lifetime it has always been there, seemingly as timeless as the mountain itself. But in all these years I have never been on those slopes, so I suggested to Peter that we follow the “path” to the anchor and beyond, and continue over the watershed to Steenbras Dam, and then “see” where we would come down again. The wind was fresh from the north-west, threatening rain which, given the Cape’s desperate drought, was a welcome prospect (it did eventually rain later that night, but we are still on course for a major water crisis at the end of this summer). We were also curious to see the level of Steenbras Lower Dam, one of the Cape’s “big six” dams that supply most of the water to the City of Cape Town, agriculture and the smaller municipalities of Stellenbosch and Drakenstein. Of the potential storage capacity of 898 Gigalitres (Gl) in these six dams, Steenbras Lower can store 33.5 Gl – but it is currently 50.2% full (the total system storage level is lying at 30.4%, which means our water will run out in April, if not March – well before the winter rains hopefully set in). The story of Cape Town’s race to match water supply with population growth and consumption is told by the construction of the initial reservoirs on Table Mountain at the advent of the 20th century and subsequently the damming of all the major rivers in the hinterland. All of the “big six” are located in the mountain valleys 50 or more kms from the Peninsula. Steenbras Dam was pitched in 1916 and completed in 1921. It supplied most of greater Cape Town’s water needs until the 1950s. Thereafter consumption and storage capacity increased exponentially to the point where the city is now hitting its ecological limits as climate change inexorably dries the area. The lake’s shores used to be a popular picnic site, accessible from Sir Lowry’s Pass or the road up from the bay, but for some reason the city closed it to the public many years ago. The only section of the Steenbras Nature Reserve still accessible to the public is the Steenbras River Gorge below the dam wall. It is a pity because there’s a lot of mountain wilderness to the south of the lake towards the Kogelberg Nature Reserve. Undeterred, we scrambled up through the anchor and the kloof beyond, across a starkly beautiful, burnt, boulder strewn landscape, stepped over the scant remains of a fence to the eerily deserted lakeshore, where we enjoyed the silence and lunch. Then we marched down the Steenbras access road and through the manned access gates as if we owned the place. The guards seemed unfazed. Below the Steenbras lookout site a zigzag path descends to a waterworks station, which I guess is the route of the the original pipeline from the dam, but below the station the pipeline gully is steep and tricky. From above it looked easier than it was and the descent did not do Peter’s gammy ankle much good. In this gorge Port Jackson willow presents a serious infestation problem, only fuelled by the recent fires. Litter from the lookout and industrial detritus from the waterworks are scattered everywhere. The city should really take its custodianship of the biodiversity of these mountains seriously. It boasts about the World Heritage Site status of the catchment on its website, after all.